US Senators Murphy, Johnson propose authorizing up to $1B for projects reducing Europe's energy dependence on Russia. Autocephaly emphasizes the fact that Putin has politically lost Ukraine - Volker. Ecumenical Patriarchate restores Ukraine’s Patriarch Filaret, Archbishop Makarii to canonical status. Over 50 percent of Ukrainians ready to defend their homeland with lethal force. Ukrainian soldiers retake village in Donbas used by Russian-led forces as firing-point. "The Lord heard our prayers, this victory over the Moscow demons," - Poroshenko, on the decision of the Synod of the Ecumenical Patriarchate on Autocephaly of Ukraine. Constantinople launches the creation of an autocephalous church in Ukraine - the historic decision of the Synod of the Ecumenical Patriarchate. Patriarch Filaret briefed on the decision of the Synod of the Patriarchate of Constantinoplek. U.S. Senators Chris Murphy and Ron Johnson on Wednesday introduced the European Energy Security and Diversification Act to provide new tools for the United States to combat malign Russian influence and create economic opportunities at home and abroad. "Russia uses its dominance of the energy market, along with bribery, corruption, and propaganda, to undermine Western institutions and install pliant governments that are unable or unwilling to counter Russia or its president, Vladimir Putin," a statement on Senator Murphy's official website says, Censor.NET reports. The European Energy Security and Diversification Act will authorize $1 billion in U.S. financing for European energy projects that, paired with increased diplomatic and technical support, will help diversify Europe’s energy supply and decrease Russia’s hold on the region. "Corruption, graft, bribery, propaganda, illegal invasions – the Kremlin is doing everything it can to gain power over countries in their periphery. We’ve rightly invested billions to shore up military defenses in eastern Europe, but let’s not forget the equally dangerous implications of Russia’s energy stranglehold on Europe," said Murphy. "Vladimir Putin gets away with a lot because so much of Europe relies on Russia for energy. By helping our allies secure new sources of energy and contributing to strategically important projects, we can help break Putin’s grip on Europe and create jobs here in the U.S.," .S. said Sen. Johnson, Ranking Member and Chairman of the U.S. Senate Foreign Relations Subcommittee on Europe and Regional Security Cooperation. "Russia has the means to coerce political behavior in nations that are dependent upon its energy. It has demonstrated its will to do so. This bill authorizes the USTDA and other agencies to support U.S. private sector investment in strategically important energy projects in Central and Eastern Europe. It will support U.S. national security interests by promoting increased energy security and market diversification in Europe," he said. The European Energy Security and Diversification Act of 2018 would authorize up to $1 billion in financing to catalyze U.S. public and private sector investment in strategically important energy projects in eligible countries from fiscal year 2019 to 2023, including natural gas infrastructure such as interconnectors, storage facilities, LNG import facilities, and reverse flow capacity; electricity infrastructure including transmission infrastructure, storage projects, and smart grids. The legislation would also authorize the U.S. Trade and Development Agency (USTDA) $5 million per year in appropriations for project feasibility studies, reverse trade missions, pilot projects, and technical workshops to support projects in the earlier stages of development. It would also encourage the State Department to ramp up its political and diplomatic support to eligible countries such as by facilitating negotiations for cross-border energy infrastructure and assisting eligible countries improve their energy markets and regulatory environments. The branch of the Ukrainian Orthodox Church from the Russian Orthodox Church will be underlined by the fact that in political terms, Vladimir Putin has lost Ukraine. This was stated by the Special Representative of the United States Department of State for Ukraine Kurt Volker, according to Censor.NET with reference to UNIAN. "I hope there will be no protests and no violence in Ukraine after the decision on autocephaly. That would be a tragedy," said the American diplomat. He also added that Russia's military aggression resulted in Ukraine, which once was loyal to it, to become a more pro-Western country. "Russian leaders are pushing the Ukrainian people away from historical relations with Russia," the State Department spokesman said today in Brussels. "Ukraine is now more united, more nationalistic and focused on Europe, NATO and the West than ever before, and this is a direct consequence of Russia's invasion and murder of Ukrainians," Volker said. The schismatic Patriarch of Kyiv, Filaret, and the schismatic Archbishop of Ukraine, Makarii, are as of today considered canonical hierarchs of the Orthodox Church. As reported by Censor.NET citing Оrthodoxia.info media outlet, the two clerics, who are the heads of Ukraine’s two schismatic Churches, had made an appeal to the Ecumenical Patriarchate requesting their past convictions be re-assessed. Subsequently, on Sept. 7, Ecumenical Patriarchate has appointed two Exarchs in Kyiv as part of preparations for granting autocephaly to Ukraine's Orthodox church. "Within the framework of the preparations for the granting of autocephaly to the Orthodox Church in Ukraine, the Ecumenical Patriarchate has appointed as its Exarchs in Kyiv His Excellency Archbishop Daniel of Pamphilon from the United States, and His Grace Bishop Ilarion of Edmonton from Canada, both of whom are serving the Ukrainian Orthodox faithful in their respective countries under the Ecumenical Patriarchate," the Ecumenical Patriarchate said in an announcement. Some 52 percent of Ukrainians expressed readiness to use lethal force to defend the territorial integrity of the country in case of need. "Some 52 percent of respondents expressed readiness to defend the territorial integrity of Ukraine, using deadly force, in case of the relevant threat (there were 54 percent of such respondents in 2017, 33 percent in 2012)," say findings of a poll conducted by the Rating Sociological Group, Censor.NET reports citing UNIAN. Most of such respondents live in the west of Ukraine (63 percent), while half of those polled in the center and in the south spoke in favor of the statement. Meanwhile, the relative majority in the east (55 percent) said they were not ready to act with lethal force (35 percent were ready, 10 percent could not answer). At the same time, males and wealthy respondents are more patriotic. The survey was conducted on Sept. 27-Oct. 4 among the population aged 18 and above in the form of face-to-face interviews. The sample of 2,000 respondents is representative of the population by age, gender, region and type of a populated locality. The margin of error is no more than 2.2 percent. Servicemen of Ukraine's Joint Forces have retaken an uninhabited village in the 'neutral zone' near the town of Volnovakha, the Donetsk region. Ukrainian troops advanced 1.2 km forward amid a special operation, Back and Alive NGO said on social media on Oct.10, Censor.NET reports citing UNIAN. "The village where there were 80 residents before the war is located in the so-called 'gray zone'," the statement reads. Despite an agreed ceasefire, Russia's hybrid military forces used the village as a base to open fire on Ukrainian positions. Locals left the village several years ago, as Russian-backed terrorists had held the local population in fear, and then looted their destroyed houses. The village has turned into a minefield. Russian-made PMN-2 anti-personnel mines, which are prohibited by the Geneva Convention, were planted there. "Judging from how they were 'arranged,' they were planted by professional servicemen," it said. Russian-made field rations whose labels indicated the place of production facilities, for example, Perm and Moscow, as well as remnants of ammunition of the Armed Forces of the Russian Federation with erased markings were found in the "gray zone," it said. President of Ukraine congratulates the Synod of Constantinople on granting autocephaly to the Ukrainian Orthodox Church. As Censor.NET reports, Poroshenko said this during his address. Recall that on October 9, the meeting of the Synod of the Ecumenical Patriarchate began in Istanbul. It is expected that it will consider the issue of giving Tomos the Orthodox Church in Ukraine. On September 7 it became known that Ecumenical Patriarch Bartholomew appointed exarchs to provide autocephaly to the Ukrainian Church. The Ecumenical Patriarchate has decided to provide autocephaly to the Ukrainian church. According to Cenzor.NET, this is reported by Ratriarchate.org. The text reads: "Under the chairmanship of the Ecumenical Patriarch, the Holy Synod held a regular session from 9 to 11 October 2018 to study and discuss items on its agenda. 1) Confirm the decision already taken that the Ecumenical Patriarchate begins to provide Autocephaly to the Church of Ukraine. 2) To restore Stavropigius of the Ecumenical Patriarch in Kyiv, one of his numerous stauropegions in Ukraine, which always existed there. 3) Adopt and consider the petition for the appeal of Filaret Denisenko, Makaria Maletich and their followers who were in a schism, not for dogmatic reasons, according to the canonical prerogatives of the Patriarch of Constantinople to receive such petitions from the hierarchs and other clergy from all the Autocephalous Churches. Thus, the aforementioned were canonically restored to their hierarchical or priestly rank, and their faithful were restored to communion with the Church. 4) To abolish the legal obligation of the Synodal Letter of 1686, issued in the circumstances of the time that gave the right, through the economy, to appoint the Moscow Patriarchate Metropolitan of Kiev, elected by the Assembly of the Clerics of his diocese, who will mark the Ecumenical Patriarch as the First Hierarch at any celebration, proclaiming and confirming their canonical dependence on the Constantinople Maternal Church. 5) appeal to all parties involved to avoid the conferral of churches, monasteries and other objects, as well as any other act of violence and revenge, so that the peace and love of Christ reign." The head of the UOC-KP Patriarchate held a briefing on the latest decisions of the Synod of the Patriarchate of Constantinople. According to Censor.NET, a direct broadcast was conducted by Radio Liberty. Anathema imposed by the Russian Orthodox Church on the leaders of these churches - Filaret and Macarius - was also removed. Attacks on the servers of government agencies in Germany are carried out by Russian hackers, including those that have a direct relationship with the GRU of the Russian Federation. According to Censor.NET, with reference to Ukrinform , such opinion is shared, in particular, Interior Minister Horst Seihofer and head of the Federal Agency for Information Security of the Federal Republic of Germany (BSI) Arne Schneubier. "There is a high probability that military intelligence is a source (attacks), but we certainly can not disclose the circumstances that led us to these facts and analysis," Seihofer told reporters on Thursday, presenting the BSI report "The situation in the field of information and communication, technological safety ". Schneubier also considers it incorrect to report every attack. He called two known examples: an attack on the Foreign Ministry and on the Bundestag. The attempts of these attacks BSI chief considers unsuccessful despite the fact that still a small number of not very secret documents were stolen. In this case, the German experts used countermeasures as good and assured that in the future everything will be done to prevent such attacks. Earlier on the same day, Schoenbey on the ZDF TV channel said: "We have very clear technical instructions indicating that it comes from the east, from Russia." Also, experts are confident in the Russian roots of the Snake group and agree that in the footsteps of the case Violinists also worked Russian specialists. He announced this at a meeting with the commanders of the Brigade Armed Forces, the National Guard and the State Border Guard Service in the framework of a working visit to the Khmelnytsky region, reports Ukrinform. According to Poroshenko, it is necessary to be prepared for any scenarios - both for defense and for effective counter-offensive. "We should not be subjected to provocations in the area of ​​the United Force, but permit and command to use all the forces and means subordinated to you as a fire in response to the preservation of our lives," said Poroshenko. The president noted that the army should not fight, not great blood, but quality and professionalism. -Recall that the government approved the procedure for the use of weapons in the Armed Forces in connection with Russian aggression. An official address to the Ecumenical Patriarch Bartholomew I was published on the official website of the registered Kuban Cossack Army I. Russian Cossacks demand that the hierarch refuse to give an autocephaly to the Ukrainian Orthodox Church, threatening to "stand up for the unity and integrity of its Motherland and its Mother Church". This is reported by Tsensor.NET with reference to Radio Liberty. As the press service of the Kuban Cossack troops noted, at the moment the appeal is published only on the site and only in Russian, which Patriarch Bartholomew, the Turks of nationality, does not know. Will it be officially sent to Fanar - the district of Istanbul, where the residence of the Patriarch of Constantinople is located, is still unknown. Referring to historical facts, the authors of the appeal forget: half of its history, the Russian Orthodox Church was under the church control of Constantinople. And scientific disputes about the conditions and to what extent the Constantinople hierarchs at the end of the seventeenth century (by the way, under the pressure of the Turkish government, who did not want to quarrel with the Moscow kingdom at that time) handed over to Kyiv the power of "the patriarch of Moscow and of Russia and the North countries ", continue through three centuries. "During the Great Patriotic War, the Cossacks fled the Nazi plague not only from Russia but from all over Europe as well, and when we began to revive after many years of oblivion and persecution, the Russian Orthodox Church and Orthodox faith were revived and strengthened with us. .. You, Lord, in one stroke of the pen, you want to destroy the established peace and spiritual equilibrium that prevails in our Eastern Slavic region. But today our turn came to protect the Russian Orthodox Church ... Russian Cossacks and, in particular, Cossacks of Kuban azachoho troops have long been a true "Host Christmas" knights of Orthodoxy, which have always been ready to defend the unity and integrity of their homeland and their Mother Church "- warns Kazak Patriarch Bartholomew. Of "peace and spiritual equilibrium... in the East Slavic region," the Kuban Cossacks certainly do not know from the rumor: together with the Russian military, they provided the "Russian Spring" military support in Crimea, alternating near the building of the Council of Ministers in Simferopol, at checkpoints "Perekop" and "Turkish shaft". Also, the Kubans (in fact, to a lesser extent than the units of the Union of Cossacks of the Region of the Don forces, headed by Ataman Mykola Kozitsyn) participated in hostilities in the Donbas. Obviously, the appeal is addressed, first of all, to the Russian reader, in order to demonstrate the unity of the registered Cossacks with the position of the Moscow Patriarchate. This is confirmed by arguments that can easily be refuted in a serious theological dispute as well as the language in which this appeal is published: it is unlikely that the Patriarch of Constantinople will be able to read the text in Russian. In the Kuban Metropolitanate, Radio Liberty stated that they have nothing to do with this appeal, which, moreover, violates the canons - the head of the Church must communicate with him equal to the primate, and this appeal is made without the blessing of the hierarchy. - And are the Cossacks, the descendants of the glorious Cossacks? It seems to me in connection with the argumentation that they have not been written. The Patriarchate of Constantinople has now realized the favorable moment to return its metropolitanate, which was transmitted to Moscow in 1686, not all, but only in the amount of two episcopal chairs - Kiev and Chernihiv, because these lands were then under the Moscow state and asked Moscow autocrat John and Petro Alekseevich Moreover, without the will of the sultan, who hoped for peace with Moscow, no transfer would have taken place, "said the Radio Liberty, the ecclesiastical historian, the candidate of theology, Igumen Innocent (Pavlov), commented on the Radio Liberty appeal of the Kuban Cossacks. According to him, then, the Russian Church did not comply with all the conditions of the transfer, namely the right of the Kiev department, when the metropolitan was elected by representatives of the clergy and the Cossacks. - In any case, the Moscow state over Ukraine has long been absent. So it's time to take care of Patriarch Bartholomew by the arrangement of the Ukrainian church on the principles of autocephaly, to which the Orthodox in this country have a desire - summed up hegumen Innocent. - Cossacks have always been called Orthodox knights, from time immemorial. When the Western knights defended their castles and possessions, we defended our faith in Christ. Who gave this right to Bartholomew, knowing perfectly what church in Ukraine is true, to split the Orthodox? You know, this is a continuation of the war against Russia, which lasts all the last decades. Bartholomew sits in Turkey, and this country of NATO - of course, under whose baton he dances - Radio Liberty, one of the regional atamans of the Kuban Cossack army, told Radio Liberty on condition of anonymity. According to him, atamans have not yet received an order to go and protect the temples of the Moscow Patriarchate in Ukraine, as volunteers in the winter of 2014 they went to Crimea. "But if the order will be, we are ready," he added. - There are our n shrines, there Lavra. This is even more terrible than NATO bases, if the laurels are occupied by scholars. Russian people, Orthodox, will not let this happen! - there is no doubt the ataman. - If we do not get out, the Lavra holidays will come out of the caves and stop this blasphemy. As pilgrims we will go to Kiev, we will go to defend the Orthodox shrines. Believe me, the splitters will be irritating. The head of the Ukrainian Orthodox Church of Kyiv Patriarchate Filaret believes that other Orthodox churches have the right to exist in Ukraine, but only those who will be part of a single local church will be called the "Ukrainian Church". He said this at a briefing on Thursday in Kyiv, informs Censor.NET, referring to Interfax-Ukraine. "Creating a single local Orthodox Church in Ukraine does not mean that there can not be other churches in our Ukrainian territory, which means the Russian Church," said Filaret. Patriarch Filaret explained that those Ukrainian dioceses who do not join the united Ukrainian Orthodox Church "will not have the right to be called" Ukrainian Church ". "And they will have the right to exist, with equal rights with the Ukrainian church. Only the name will be" Russian Church", not" Ukrainian", - he stressed. The President of Ukraine, Petro Poroshenko, said that he would not let a religious war in Ukraine after the autocephaly. He stated this in a video conversation on Thursday evening, according to Censor.NET. "There was no, there would be no state church, and in the consecrated Tomas the Ukrainian Orthodox Church would also nobody invite anyone to force." Again I emphasize that this is a matter of free choice for every believer, the joint creation of an independent church can not be the basis for discord, confrontation, violence, and we will definitely not tolerate it, "said Poroshenko. According to the president of Ukraine, the creation of a single Ukrainian Orthodox Church is a path to peace, mutual understanding and unification. "And if somewhere you see people who call to take the Lavra, monastery or temple by force, know that this is a Moscow agency. Because the Kremlin's goal is to fuel the religious war in Ukraine, and this is definitely not my plan, not the plan of the Ukrainian people and Ukrainian state", - said the president. Poroshenko also stressed that Ukraine will respect the choice of those who decide to remain in that church structure, which will maintain the loyalty of the Russian Orthodox Church. According to Censor.NET, several sources in the Russian government reported this to Reuters. Later, this information was confirmed by Russian Energy Minister Alexander Novak. According to him, the protocol signed by the states provides for a ban on the supply of dark petroleum products, diesel fuel. "As for gasoline, diesel fuel, fuel oil - indicative balance sheet provides zero indicators," - says Novak TASS. In this case, the agreement provides for the preservation of supplies of certain petroleum products that are not produced in Belarus - this is the production of petrochemical plants. Previously, Russia imposed a ban on the export of light and dark petroleum products, as well as liquefied hydrocarbon gas (SVG) reported to Reuters. Sources of the agency reported that the exception would be oil, natural gas, gas condensate, a wide fraction of light hydrocarbons, as well as a number of petroleum products for petrochemicals, the export of which will be regulated by indicative balances and protocols to an agreement between Russia and Belarus. "The protocol provides for small volumes of exports, in particular, a number of gasoline components that can be used in petrochemicals, as well as a wide fraction of light hydrocarbons, oils, petroleum jelly," he added. In the Ministry of Energy of the Russian Federation from the comments Reuters refused, referring questions to Deputy Prime Minister Dmitry Kozak, who oversees the industry. Cossack spokesman Ilya Juss confirmed the complete ban on deliveries of dark petroleum products to Belarus to avoid losses to the Russian budget and to avoid gray schemes. He did not comment on the volumes of export of other petroleum products. The Russian politician gave false information about the Ukrainian politician Stepan Bandera, who allegedly shot Jews. He spoke about this on the air of the TV channel "Russia-1". In the course of the Russian propaganda broadcast, they raised hysterics around Ukraine. The studio talked about the Russian-Ukrainian relations and the "problems" of our country. "They forgot Bandera? He shot the Jews, pushing down his pants, shot all the circumcised, OUnivtsi," said one of the broadcasters during the video in real time with the studio. As reported by "Apostrophe", the network was amused by the story on RosTV about life in Kyiv. A resident of Kyiv on the air of one of the TV channels said that he was ready to go to Moscow to confess and to partake in the event of the autocephaly of the only Ukrainian church. Russia stops manned launches of missiles until the causes of the shipwreck "Soyuz MS-10" will be clarified. This was stated by Deputy Prime Minister of Russia Yuriy Borisov. He added that the Russian side does not intend to conceal the results of the investigation from the United States. Borisov called Borisov today an "unpleasant situation," but noted that it proved the reliability of the emergency rescue system. Recall that during the transportation of astronauts to the ISS on the Russian rocket Soyuz, a technical problem with engines of the second stage arose. The crew had to make an emergency landing. 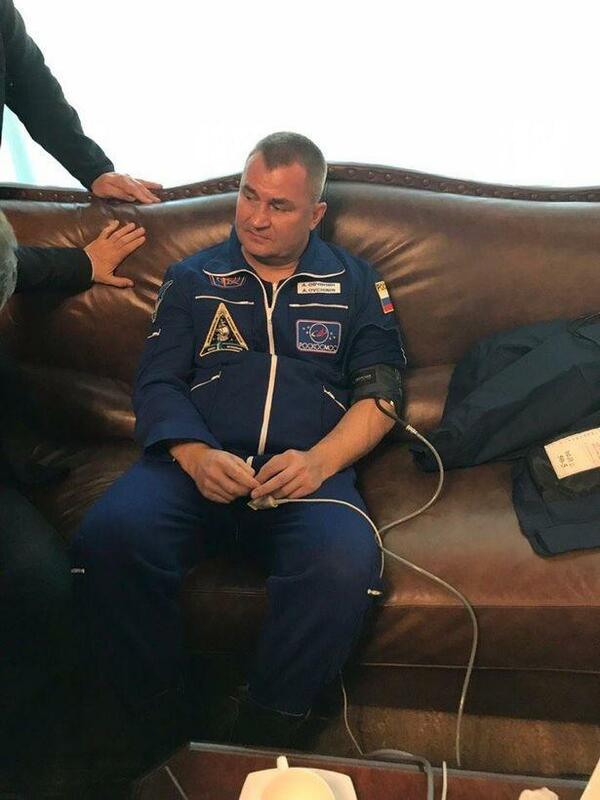 They are alive, rescuers came to the place, assessing the state of the astronauts as "good". At present, astronauts are being taken to Baikonur. Also in the network there were first photos from the place of landing rescue capsule. Read more about the incident here. The network showed a spectacular video from the moment of the incident with the Russian rocket Soyuz in Baikonur. So, in the frames you can see the moment of an accident of the Russian space rocket "Union of MS-10". At some point, the launch vehicle began to gain altitude, but an explosion is coming soon and a white mark appears in the air. Recall that during launch of the ship "Union of MS-10", which was supposed to deliver to the ISS Russian cosmonaut Alexei Ovchinina and NASA astronaut Nick Hague, an emergency shutdown of engines of the second degree occurred. There they had to conduct a series of experiments. One of the major versions of the accident occurred is the bad mounting of the block. Russian businessman, president of the Greek football club PAOK Ivan Savvid, spied for President Vladimir Putin on issues of the agreement between Greece and Macedonia. This is reported by The New York Times. "For many years, Ivan Savvyd was a Kremlin man in Greece," the report said. At the same time, US officials say they intercepted in June correspondence and phone calls proving that Savyid was working on Putin. As it is noted, the US government provided Greece with evidence of espionage by Ivan Savvidi. Greece has decided to send two Russian diplomats on charges of providing means to protest groups. As reported by the "Apostrophe", earlier in Lithuania seized three Russian spies. The suspect is threatened with up to 15 years' imprisonment for state betrayal.